Admittedly, I already have about a thousand tote bags. But the organizational nature of this one I saw on Shop Quirky caught my attention. "No more fruit bruising, yogurt spilling, lettuce getting smashed... Mercado protects your farmers market haul from carelessness. 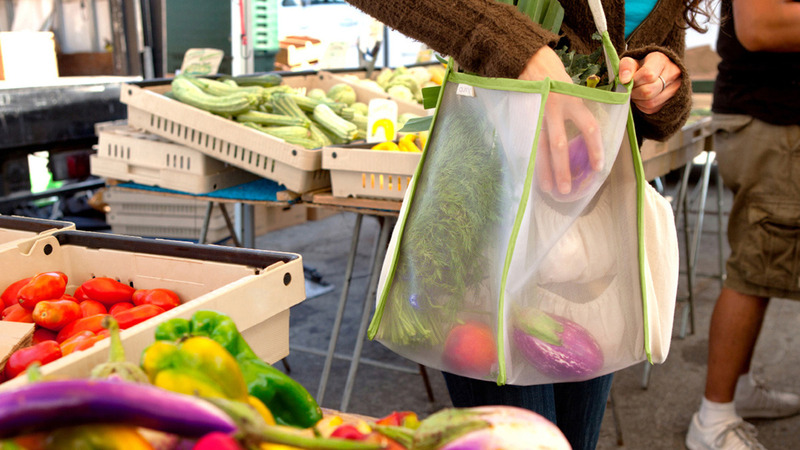 It has pockets to harbor delicate fruits and veggies, loops to hold bottles in place, and transparent compartments that keep the rest organized. Outside, it has two small pockets for quick-access items (cash, keys, etc.) so you can whip out your wallet at one farmers market stall, then the next, then the next..."
These new woven seagrass bowls from Serena & Lily are the perfect container to display produce on your kitchen island. I love the navy, but the fuschia and saffron are also perfectly appropriate for summer. I'm usually very anti-gadget when it comes to my kitchen. I read somewhere that a good rule of thumb about kitchen items is that if something only does one task (like a garlic press, which I personally find useless) then you should toss it. A non-cluttered kitchen only contains multi-purpose objects. But how many times have I bruised basil when cutting it in a hurry? That's why I'm considering these herb scissors from Terrain, "the essential tool for snipping fresh herbs into favorite dishes, five parallel blades cut herbs quickly and evenly, without crushing tender leaves."